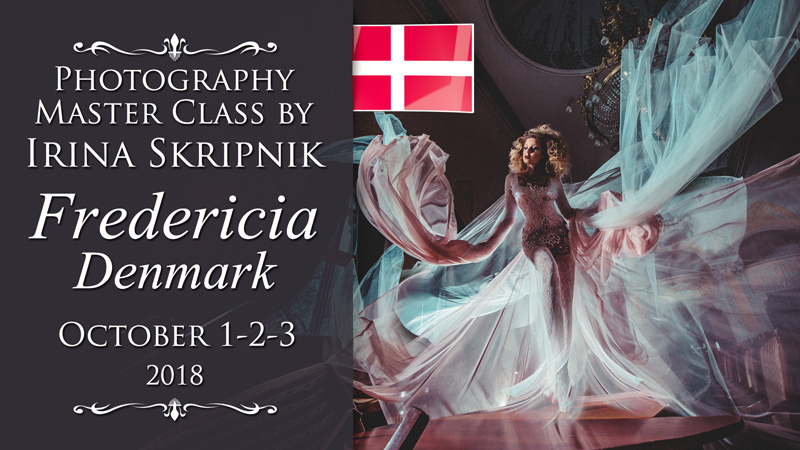 Fine-art and portrait photography master class by Irina Skripnik, Fredericia, Denmark, October 1-2-3, 2018 . Three days of shooting and post-processing. Lots of practice and theory! Please fill in this form and we will contact you! Please contact Tina Liv or Irina Skripnik to select most comfortable method of payment and for booking of your participation. Workshop program is good both for beginners and for professional photographers. – paper book and pen for notes, also you can use laptop during the lectures. 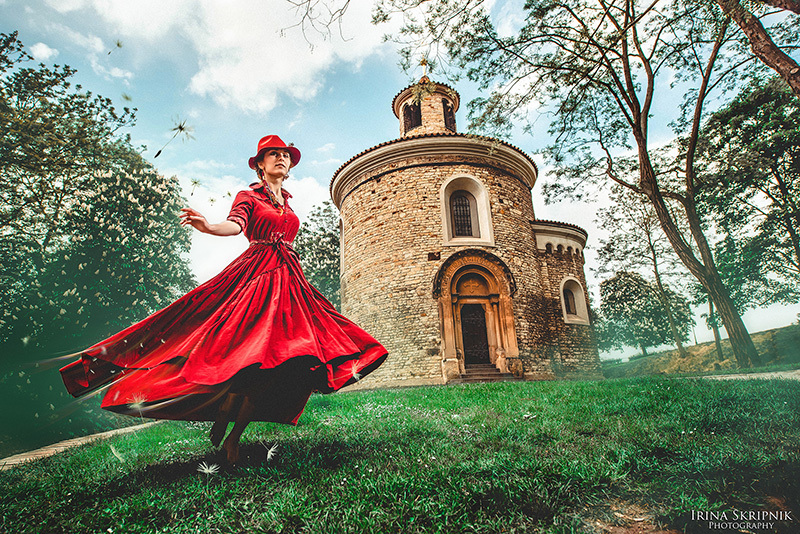 Irina Skripnik – destination wedding, event, art and creative photographer based in Odessa, Ukraine. Irina Skripnik organizes photography workshops, master classes and tours around the world. Workshop program takes three days to deep dive into the world of portrait, fine-art and creative photography. 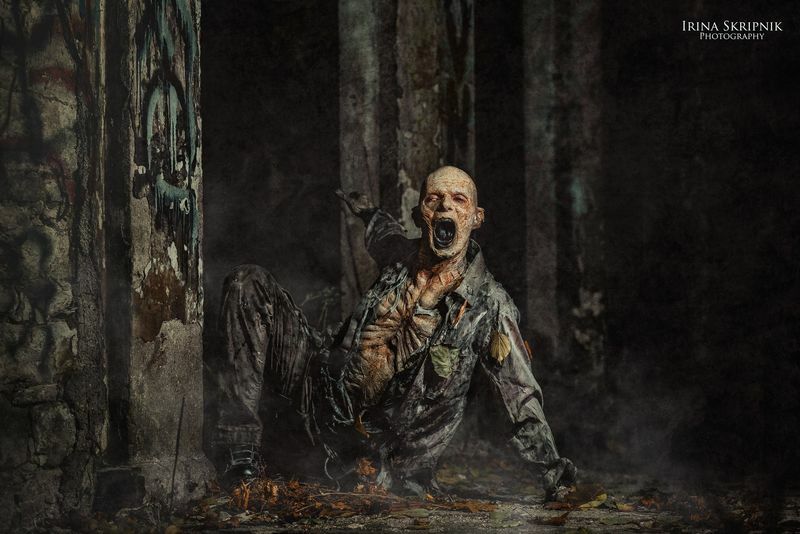 During the workshop we will do two complete photo sessions that will include demonstrations of the whole process from pre-production to post-production. You will get a lot of useful information that can be used for commercial or personal creative shooting. Part 1 – meeting and theory. The first part of our workshop will be dedicated to a group meeting, participants introductions, analysis of my work and my techniques. I will tell you all the stages of my work and what I do. You will understand all the stages of my production and what awaits you during the workshop. 1. About me and my photos. 2. Presentation of my past projects. 3. Discussion of my photos. What tools, equipment, techniques were used for production. 4. Sources of my inspiration. 5. Photo projects realization. Stages of preparation and creation of interesting and unusual shots. Part 2 – two photo sessions. This is a completely practical part, two complete photo sessions. All my students will have the opportunity to create beautiful pictures using my techniques and methods and add them to their portfolio. 1. What gear you should use depending on shooting conditions and final result requirements. 3. What camera parameters and settings you should use. 4. Variety of light sources. 5. Accessories that help in realization of creative ideas. 6. Model posing tips and aesthetics of movements. Unleashing models. 7. Creation of special effects using available tools during the session. Part 3 – the post-processing stage. 1. Technical equipment that I use for post-processing. 2. Basic software and additional plugins. 3. Analysis of the footage and the selection of successful shots. 8. How to get volume in image, working with chiaroscuro drawing (shadows and lights). 9. Textures and blending modes. 10. Creation of special effects: smoke, fog, fire, dust, lighting effects, flare, bokeh, fabulous and dream effects. 11. Areas of emphasis (accents) using sharpen, blur, color temperature. Getting rid of useless details. 12. Work with the warm and cold areas. 13. The photo painting effect. Part 4 – final discussion, questions and answers, summarizing the material. During the final part of the workshop we will summarize all the material and discuss themes that were most interesting during three days of workshop. We will discuss works of students and I will answer all the questions of my students. 1. Conclusions and summarizing of the material. 2. Answers to the questions. 3. Discussions of students photos.